This is a great story of how the Foundation Fighting Blindness (FFB) provided timely funding of $155,000 to help my lab at the University of California, San Diego (UCSD), leverage a $2 million retinal-gene discovery project. What is very rewarding for me is that FFB's support helped us find the retinal-disease gene mutation in 33 families, who were otherwise left without a clear diagnosis. Now these families are better able to understand their prognosis and which clinical trials and future therapies may be most relevant to them. My lab was also able to identify 11 new, otherwise elusive, retinal-disease genes. That information will enable geneticists around the world to genetically diagnosis more patients. Our project is ongoing, and the number of newly identified genes and diagnosed families will likely increase as we continue to analyze the data. I am also pleased to report that in addition to the leverage we were able to gain for gene sequencing and discovery, the Foundation's funding helped us renew a grant for more than $2 million from the National Institutes of Health. This is a prime example of how the Foundation plays a unique role in providing support at opportune junctures, filling critical gaps and needs, when no other organization has the expertise or resources to do so. The story began when my lab was fortunate to receive the news that Human Longevity, Inc. (HLI) — a company on the leading edge of genetic sequencing and analysis — selected our proposal to sequence the genomes of 500 people from 134 families with inherited retinal diseases (IRDs). HLI was interested in collaborating with us and liked the fact that we had all this DNA data from well-characterized IRD patients ready to go. How much DNA information did we have? Well, a person's genome — their entire collection of DNA — is composed of six billion pieces of genetic information. So, 500 genomes is a lot of data. The cost of sequencing 500 whole genomes (in 2016) ranged from $1.5—2.0 million. HLI did a great job sequencing all the genomes from the families with IRDs. But then I needed money and resources to store and analyze the data to diagnose these individuals, and hopefully, find new genes linked to IRDs. The opportune funding from the Foundation was used to provide storage and perform quality control for the data. Ultimately, 454 genomes from 118 families passed our quality control process. Also, keep in mind that these are gene mutations that would otherwise be challenging to find. I have received funding from the Foundation for two decades for a variety of important genetic discovery projects. Funding to continue the collaborative effort with HLI — which came outside of the normal grant submission and renewal process — came at a critical moment and enabled us to obtain significant funding from other resources to advance our work in finding the gene mutations that cause IRDs. Some results from Dr. Ayyagari's above-mentioned genetic-research project were featured at the 2017 meeting of the Association for Research in Vision and Ophthalmology (ARVO), May 7-11 in Baltimore, which drew about 12,000 eye research and industry professionals from around the world. 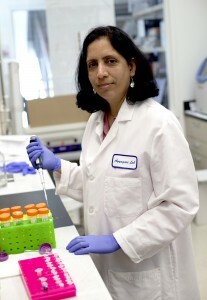 Radha Ayyagari, PhD, is associate professor of ophthalmology and pathology and chief of the Ophthalmic Molecular Diagnostic Laboratory.